(Sketch F No. 5) Preliminary Chart of Key West Harbor and Approaches. 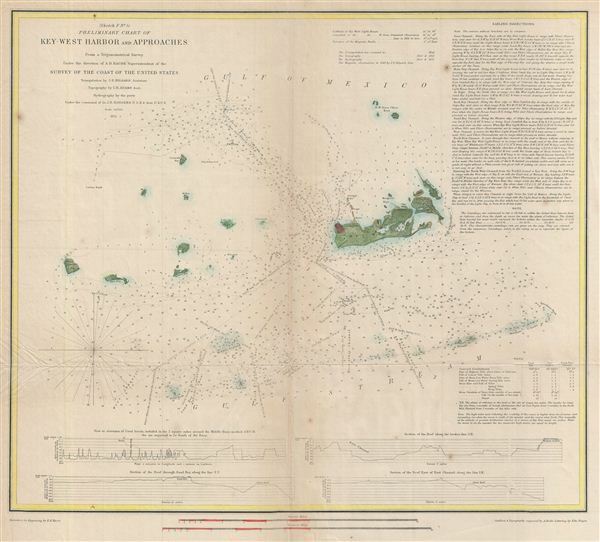 An uncommon 1855 U.S. Coast Survey nautical chart or maritime map of Key West, Florida, and its approaches. Centered on Key West, this map covers from Boca Grande Key eastward to Raccoon Key, north as far as the N.W. Boca Chica Keys and south to W. Dray Rock and Sand Key. Notes numerous channels, countless depth sounding, and offers extensive sailing instructions, as well as notes on tides, under sea elevations, and beacons. The triangulation for this chart was completed by J. e. Hilgard. The topography is the work of I. H. Adams. The hydrography was accomplished by a party under the command of J. R. Rodgers. The whole was compiled under the supervision of A. D. Bache, one of the most influential Superintendents in the history of the Coast Survey. Published in the 1851 edition of the Superintendent's Report. Good. Map exhibits typical wear, verso reinforcement, repair, and toning along original fold lines. Blank on verso. Overall toning.